In 788, about a century after the Arab conquest of North Africa, a series of Moroccan Muslim dynasties began to rule in Morocco. In the 16th century, the Sa'adi monarchy, particularly under Ahmad al-MANSUR (1578-1603), repelled foreign invaders and inaugurated a golden age. The Alaouite Dynasty, to which the current Moroccan royal family belongs, dates from the 17th century. 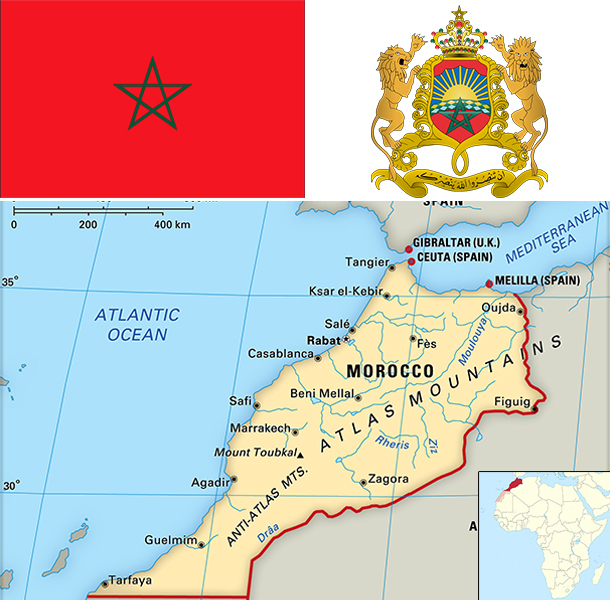 In 1860, Spain occupied northern Morocco and ushered in a half century of trade rivalry among European powers that saw Morocco's sovereignty steadily erode; in 1912, the French imposed a protectorate over the country. A protracted independence struggle with France ended successfully in 1956. The internationalized city of Tangier and most Spanish possessions were turned over to the new country that same year. Sultan MOHAMMED V, the current monarch's grandfather, organized the new state as a constitutional monarchy and in 1957 assumed the title of king. Since Spain's 1976 withdrawal from what is today called Western Sahara, Morocco has extended its de facto administrative control to roughly 80% of this territory; however, the UN does not recognize Morocco as the administering power for Western Sahara. The UN since 1991 has monitored a cease-fire between Morocco and the Polisario Front - Western Sahara's liberation movement - and leads ongoing negotiations over the status of the territory. King MOHAMMED VI in early 2011 responded to the spread of pro-democracy protests in the region by implementing a reform program that included a new constitution, passed by popular referendum in July 2011, under which some new powers were extended to parliament and the prime minister but ultimate authority remains in the hands of the monarch. In November 2011, the Justice and Development Party - a moderate Islamist party - won the largest number of seats in parliamentary elections, becoming the first Islamist party to lead the Moroccan Government. Morocco has capitalized on its proximity to Europe and relatively low labor costs to build a diverse, open, market-oriented economy. In the 1980s Morocco was a heavily indebted country before pursuing austerity measures and pro-market reforms, overseen by the IMF. Since taking the throne in 1999, King MOHAMMED VI has presided over a stable economy marked by steady growth, low inflation, and gradually falling unemployment, although poor harvests and economic difficulties in Europe contributed to an economic slowdown. Industrial development strategies and infrastructure improvements - most visibly illustrated by a new port and free trade zone near Tangier - are improving Morocco's competitiveness. Morocco also seeks to expand its renewable energy capacity with a goal of making renewable more than 40% of electricity output by 2020. Key sectors of the economy include agriculture, tourism, aerospace, phosphates, textiles, apparel, and subcomponents. To boost exports, Morocco entered into a bilateral Free Trade Agreement with the United States in 2006 and an Advanced Status agreement with the European Union in 2008. Despite Morocco's economic progress, the country suffers from high unemployment, poverty, and illiteracy, particularly in rural areas. In 2011 and 2012, high prices on fuel - which is subsidized and almost entirely imported - strained the government's budget and widened the country's current account deficit. In 2014, Morocco ended subsidies on diesel, gasoline, and fuel oil which have improved its budget deficit. Subsidies on sugar, butane gas, and flour remain. Morocco’s current account deficit has also benefit from the fall in oil prices. Key economic challenges for Morocco include reforming the education system and the judiciary, while increasing the competitiveness of the private sector.